The Southern communities are just as peaceful and religious as the Northern. The Southerner may be more highly cultured, and anything he does is naturally conspicuous. Carrying a revolver is a fad, just a fad or a fashion; but the revolvers are mightly harmless. Of course there are desperadoes on the frontier, but that is the only part of the world they live in. Their deeds give a false character to their district. I have carried a revolver; lots of us do, but they are the most innocent things in the world. Don't meddle with old unloaded firearms. They are the most deadly and unerring things that have ever been created by man. You don't have to take any pains at all with them; you don't have to have a rest, you don't have to have any sights on the gun, you don't have to take aim, even. No, you just pick out a relative and bang away, and you are sure to get him. A youth who can't hit a cathedral at thirty yards with a Gatling gun in three-quarters of an hour, can take up an old empty musket and bag his mother every time at a hundred. Think what Waterloo would have been if one of the armies had been boys armed with old rusty muskets supposed not to be loaded, and the other army had been composed of their female relations. The very thought of it makes me shudder. I was armed to the teeth with a pitiful little Smith & Wesson's seven-shooter, which carried a ball like a homopathic pill, and it took the whole seven to make a dose for an adult. But I thought it was grand. It appeared to me to be a dangerous weapon. It had only one fault--you could not hit anything with it. One of our 'conductors' practiced awhile on a cow with it, and as long as she stood still and behaved herself she was safe; but as soon as she went to moving about, and he got to shooting at other things, she came to grief. George Bemis . 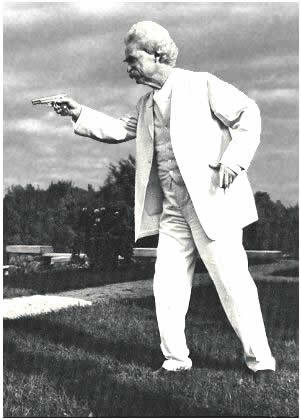 . . wore in his belt an old original "Allen" revolver, such as irreverent people called a "pepper-box." Simply drawing the trigger back, cocked and fired the pistol. As the trigger came back, the hammer would begin to rise and the barrel to turn over, and presently down would drop the hammer, and away would speed the ball. To aim along the turning barrel and hit the thing aimed at was a feat which was probably never done with an "Allen" in the world. But George's was a reliable weapon, nevertheless, because, as one of the stage-drivers afterward said, "If she didn't get what she went after, she would fetch something else." And so she did. She went after a deuce of spades nailed against a tree, once, and fetched a mule standing about thirty yards to the left of it. 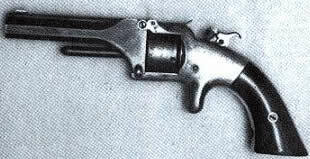 Bemis did not want the mule; but the owner came out with a double-barreled shotgun and persuaded him to buy it, anyhow. 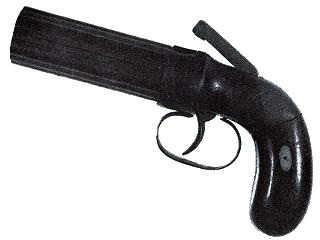 It was a cheerful weapon--the "Allen." Sometimes all its six barrels would go off at once, and then there was no safe place in all the region round about, but behind it.